ABBADIE DE SAINT-CASTIN, JEAN-VINCENT D’, Baron de Saint-Castin, French officer and Abenaki chief; b. 1652 at Saint-Castin (province of Béarn); d. 1707 at Pau. The man who was to become one of the principal chiefs of the Abenakis came from a well-established noble family of Béarn. An Abbadie de Maslacq appears in the general enumeration of the households in the viscountship of Béarn which was drawn up in 1385 by order of Gaston Phébus. In 1581 the noble estate of Saint-Castin entered the Abbadie family by marriage. In 1654 Jean-Jacques I obtained authorization from Louis XIV for the erection of this fief into a barony. In 1649 this first Baron de Saint-Castin had married Isabeau de Béarn-Bonasse, a lady of high estate, since she was descended from a branch of the house of Foix. The couple had three children: Jean-Jacques II, born in 1650, Marie, born in 1651, and Jean-Vincent, born in 1652, the same year that his mother was to be carried off by the plague. So our younger son from Béarn was motherless when he was still only a few months old. We have no knowledge whatever of the childhood and early adolescence of the younger Saint-Castin. He must have received the education peculiar to the young nobles of that period, based on a knightly conception of the military art, and with a rudimentary minimum of general knowledge. We are scarcely surprised to see his name mentioned as an ensign on the muster-rolls of the Carignan-Salières regiment, in Chambly*’s company, bound for Canada in 1665. At that time, Jean-Vincent was only thirteen! Exceptional though it was, this was not unique; we know that on several occasions very young men served in the king’s armies. And a younger son from Béarn (or from Gascony) must often have been obliged to venture out very early to seek his fortune. Had not this young man already lost his father? The question may well be asked, since in a deed of sale dated 24 Feb. 1666 Jean-Jacques II, his elder brother, signed as the second Baron de Saint-Castin. The father’s death would provide a suitable explanation of the younger son’s joining the army, where his birth and education secured him the rank of ensign. It is probable that in 1666 Jean-Vincent took part with his regiment in the campaign of the Marquis de Tracy [Prouville*] against the Iroquois. But it is not until 1670 that we see his name mentioned again. In July of that year, the treaty of Breda having restored Acadia to France, he went, still an ensign, with Captain Andigné* de Grandfontaine, the new governor of Acadia, and Lieutenant Pierre de Joybert* de Soulanges et de Marson to Penobscot Bay, to retake possession of the fort captured by the English 16 years before. It was the first contact the young 18-year-old officer had made with this almost virgin country that was to become his home. 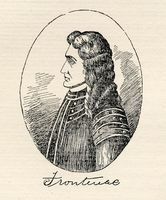 Grandfontaine established himself at Pentagouet (on the Penobscot River), and Saint-Castin did likewise. The place was what one might call a “hot spot,” right in the middle of contested territory. Indeed, the French maintained that the boundary of Acadia was at the Kennebec River, the English put it as far back as the Penobscot River, and the most enthusiastic of the Bostonians even wanted to make it the Sainte-Croix River! While these disputes were going on between white men, in the coastal region the country remained also and above all the domain of the Penobscots, and in the forests of the interior that of the other Abenaki tribes. Saint-Castin was entrusted with several missions which enabled him to study the men and the country. 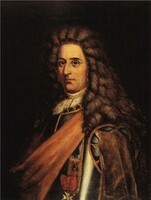 In 1673 Grandfontaine was replaced by Jacques de Chambly as governor of Acadia. The following year, when everything was peaceful, Saint-Castin was to become acquainted, somewhat brutally, with Dutch pirates who were allied with the Bostonians. Chambly, with 30 men, was able to hold out for only an hour against 110 assailants; he was taken prisoner. Saint-Castin, after being tortured with a brimstone match, managed to escape. He hid for a few days among the Indians, who were already his friends, then set off through the woods towards Quebec. 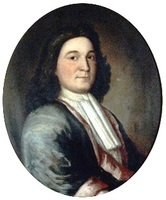 During the four years that the ensign, in the eagerness of his youth, had roamed everywhere through the colony on the Penobscot, an advanced bastion of Catholic France in immediate contact with Puritan New England, he had already admirably understood all the problems of this veritable Indian “march.” And while Saint-Castin was making his report at the Château Saint-Louis, Buade* de Frontenac, good judge that he was, was sizing him up. The governor general of Canada saw how this young, intelligent, and enthusiastic officer could be utilized; on the spot he proposed a line of conduct for him that was to set the pattern for his whole life. The mission that he entrusted to him did not take the form of a written order; it was discreetly mentioned in the “Mémoire des services rendus par les sieurs de Saint-Castin, père et fils, dans le pays de Canada en la Nouvelle-France,” drawn up in 1720 by Jean-Vincent’s son, Bernard-Anselme; in it we read: “[Saint-Castin] had the good fortune to escape and to make his way to Quebec to receive the governor’s orders, which were to urge the Abenakis and other nations throughout the whole colony of Acadia to adopt the interests of the king of France.” Furthermore, the rest of Jean-Vincent’s life shows clearly enough what was at stake in this mission. In the same year, 1674, the young man became the third Baron de Saint-Castin on the death of his elder brother, who left no posterity. But the time had not come to go and collect inheritances, and the ensign threw himself unreservedly into the adventure awaiting him. From that time on Saint-Castin, who seems to have been no longer subject to any official authority, appears to have divested himself almost entirely of his position as a French officer. He divided his time between a Penobscot tribe, which finally adopted him, and his dwelling at Pentagouet, a mere pied-à-terre which must have comprised a factory and a storehouse for merchandise, for he also began to engage in trade. Saint-Castin chose a wife in his tribe. According to tradition the Indian baroness was very pretty. Moreover she was not a mere nobody, since she was the daughter of the great Penobscot chief Madokawando. Saint-Castin knew how to conciliate love and political acumen. The Algonkin name of this bronze-skinned spouse must have been Pidianske or Pidiwamiska, and her Christian name Marie-Mathilde, unless two distinct women are involved. Saint-Castin has been accused, without too much proof, of having had several wives, legitimately or as concubines, and of having lived a dissolute existence deep in the Acadian forests. These are insinuations spread abroad by his enemies, which were to be utilized later in the attempt to contest his right to the family inheritance. It is true that the baron’s marriage took place at first according to Indian custom, perhaps before 1678, but it is certain that in the last quarter of 1684, at Pentagouet, Father Jacques Bigot, the Jesuit missionary to the Abenakis, acting on the express order of Bishop Laval of Quebec, received the consent of the couple according to Catholic rite. Saint-Castin was entirely an Abenaki, to the extent of making the interests of his new compatriots his own. If he engaged in the fur trade, if he maintained close business relations with Boston, in defiance of the rules of the French administration, it was precisely because being more Abenaki than French he no longer considered himself affected by them. But as the French needed an alliance with the Abenakis, the court, the governors general of Canada, and the governors of Acadia always dealt tactfully with the baron and treated him with the consideration due his rank. Officially, moreover, this rank remained a modest one, for Saint-Castin avoided ostentation in everything. Until his death in 1698, Madokawando was the sole great chief of the Penobscots; he had his lieutenants who were in command of the warriors, led expeditions, and parleyed with the enemy when truces were made. But it was known everywhere that nothing was done without his son-in-law’s advice, and that the latter had only to express a wish for it to be instantly complied with. After Saint-Castin had settled among the Abenakis, King Philip (Pometacom) and his warriors ravaged New England in 1675 [see Church]. The Penobscots and the Abenakis did not enter the struggle until 1676, after an attack had been made on one of their chiefs. One may reasonably suppose that Saint-Castin began to exercise his talents as a military counsellor on the occasion of this war. Indeed, the people of his nation displayed consummate skill at it, holding in check at every point, from the Penobscot River to Salmon Falls, N.H., and even beyond, 700 regular troops, and even inflicting humiliating defeats upon them. With the return of peace the governor of New York, Sir Edmund Andros, hastened to have a fort constructed at Pemaquid, between the Penobscot and Kennebec Rivers. But the strategy and superior equipment of the Abenakis had not failed to intrigue and worry the people of Boston and New York. They endeavoured to find out what might be behind this, and they finally learned of the existence of “a reduced French officer, who had married a daughter of Madokawando, and kept a trading house at Penobscot, where he considered himself as independent, being out of the limits of any established government. . . .” (Belknap) They then lost no time in making him advances to win him over. But Saint-Castin rejected the English offers. The Bostonians then thought they could intimidate him. As the joint frontier commission had not yet taken any decision about this part of Acadia, in 1686 Judge John Palmer of New York ordered wine stored on Abenaki territory to be seized and called upon the baron to apply to His Britannic Majesty for the land grant of Pentagouet, on condition, of course, that he take the oath of allegiance to the British monarch! This meant that Saint-Castin had to commit himself, which he promptly did by addressing his request for a land grant to the court at Versailles. In that same year Brisay de Denonville recommended him for the governorship of Acadia, if Perrot* were to leave his post. Saint-Castin set out for Canada with a detachment of Abenakis in order to take part in Denonville’s expedition against the Iroquois (1687). Andros took advantage of this absence to pillage the baron’s dwelling at Pentagouet. He tried also to suborn Madokawando, but to no avail. When the War of the League of Augsburg broke out (1689), the Penobscots and the other Abenakis resumed their forays against the English settlers with greater vigour than ever, not hesitating to put even towns to fire and sword by extraordinarily daring surprise attacks. In 1690 Madokawando and Saint-Castin personally commanded the Penobscots who joined René Robinau de Portneuf’s column, which was sent from Canada to attack the town of Casco (near present Portland, Me.) on the Atlantic. The same year, alerted by the spies whom he maintained in New England, Saint-Castin was able to give Frontenac timely warning of Phips*’s preparations against Quebec. Saint-Castin had become a thorn in the English side. In 1692 Phips did not scruple to hire two deserters to murder Saint-Castin, but the plot was thwarted by two Acadians, Jean Serreau de Saint-Aubin and Jacques Petitpas. For a long time Frontenac had been toying with a plan to strike at the heart of New England by attacking Boston or New York, and he kept on badgering the court to carry it out. 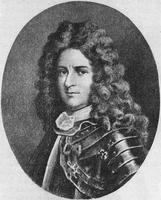 Meanwhile Pierre Le Moyne d’Iberville had been instructed to destroy the fort at Pemaquid, which constituted a permanent threat to Acadia. Saint-Castin gave the bold sailor valuable assistance with his warriors, who had been joined by the Passamaquoddys and the Malecites. Pemaquid fell on 15 Aug. 1696 under the combined action launched by Iberville’s fleet and the land forces. Madokawando died in 1698, probably leaving the position of principal chief of the Penobscots to his son-in-law. 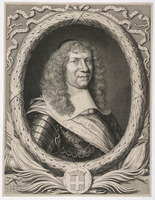 But when peace returned at the end of 1699, Saint-Castin, always concerned for his independence, quickly resumed his commercial operations with New England, without worrying about the French regulations. Once more accusations were levelled against him, and despite a favourable report by Governor Brouillan [Monbeton], the baron decided to return to France, to clear himself and (finally!) to straighten up his personal affairs. He left Pentagouet at the end of 1701. Once at Versailles, he had no difficulty in dispelling Pontchartrain’s prejudices. In 1702 he arrived in his native Béarn. His brother-in-law, the judge Jean de Labaig, his sister Marie’s husband, was waiting for him armed to the teeth, ready to sink the estate, of which he had to render an account, into a morass of legal procedure. With a skill worthy of a better cause, Labaig managed things so well that he piled one obstacle upon another, after having already done all he could to prove that Jean-Vincent’s birth was illegitimate. The court, which wanted to send Saint-Castin back as quickly as possible to Acadia, where he was needed more than ever, intervened energetically in the parlement of Pau to hasten the passing of judgement. It was all in vain. In 1707, exhausted by quibbling and chicanery, Jean-Vincent d’Abbadie, third Baron de Saint-Castin, died at Pau without seeing Acadia again. He left several children, of whom only some are known to us: his eldest son, Bernard-Anselme, born in 1689; then Joseph*; another son whose first name we do not know; and two daughters, Thérèse and Anastasie, who on the same day, 4 Dec 1707, married Philippe Mius d’Entremont and Alexandre Le Borgne de Belle-Isle respectively. Another boy, Jean-Pierre, who studied at the Petit Séminaire of Quebec, died at the age of eight. Another daughter, Ursule, is thought to have married Louis Damours de Freneuse in 1715. AN, Col., B, 16, 19, 22, 25; C11D, 2–6 BN, MS, Clairambault 874, ff.167, 171, 381; 880, f.302; NAF 7485, f.178 “Mass Archives,” XXXVI, 78, 96, 206; XXXVII, 40, 101, 102. Charlevoix, History (Shea), III, IV, V. Church, King Philip’s war (Dexter), I, II. Coll. de manuscrits relatifs à la N.-F., I, II. “Correspondance de Vandreuil,” APQ Rapport, 1939–40. Diéreville, Relation of voyage to Port Royal (Webster). William Hubbard, The history of the Indian wars in New England (Boston and London, 1677; new ed., Roxbury, 1865) Hutchinson, Hist. of Mass.-bay (1765). Lahontan, Nouveaux voyages, II. La Potherie, Histoire (1722). Increase Mather, Abrief history of the war with the Indians in New England (Boston and London, 1676). Mémoires des commissaires, I, xxiv-xxv, 51; Memorials of the English and French commissaries, I, 29, 122. 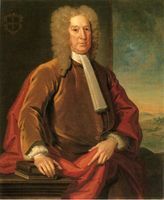 Daniel Neal, The history of New-England . . . to the year 1700 . . . (2v., London, 1720), I, II. NYCD (O’Callaghan and Fernow), IX. P.-G. Roy, Inv. concessions, IV, 44. J P. Baxter, The pioneers of’ New France in New England, with contemporary letters and documents (Albany, 1894). Jeremy Belknap, The history of New Hampshire (2d ed., 3v., Boston, 1813), I, 130–31. Bernard, Le drame acadien. Coleman, New England captives. Pierre Daviault, Le baron de Saint-Castin, chef abénaquis (Montréal, 1939). Dufau de Maluquer, “Notice généalogique sur la maison d’Abbadie de Maslacq,” RSCT, 2d ser., I (1895), sect.i, 73 Lauvrière, La tragédie d’un peuple. Robert Le Blant, Une figure légendaire de l’histoire acadienne: le baron de Saint-Castin (Dax, ) J.-A. Maurault, Histoire des Abénakis depuis 1605 jusqu’à nos jours (Sorel, 1866). Rameau de Saint-Père, Une colonie féodale. Robert Rumilly, Histoire des Acadiens (2v., Montréal, ). Sylvester, Indian wars.W. D. Williamson, The history of the state of Maine, from its first discovery, a.d. 1602, to the separation, a.d. 1820, inclusive (2v., Hallowell, Me., 1832). “Les barons de Saint-Castin,” BRH, IX (1903), 222–23; see also “A propos du sieur de Saint-Castin,” BRH, XLI (1935), 611 Ganong, “Historic sites in New Brunswick,” 313 Gorham Munson, “St. Castin: a legend revisited,” Dalhousie Review (Halifax), XLV (1965–66), 338–60. Georges Cerbelaud Salagnac, “ABBADIE DE SAINT-CASTIN, JEAN-VINCENT D’, Baron de Saint-Castin,” in Dictionary of Canadian Biography, vol. 2, University of Toronto/Université Laval, 2003–, accessed April 22, 2019, http://www.biographi.ca/en/bio/abbadie_de_saint_castin_jean_vincent_d_2E.html.